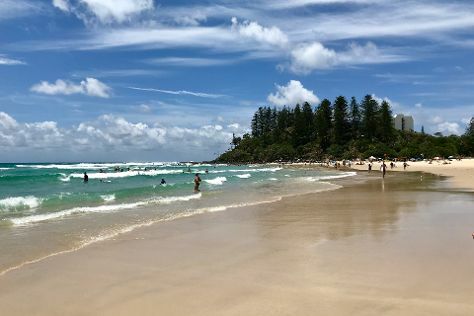 Start off your visit on the 3rd (Tue): browse the different shops at Robina Town Shopping Centre, then enjoy the sand and surf at Coolangatta Beach, and then kick back and relax at Burleigh Heads Beach. Here are some ideas for day two: get outside with Pelican Feeding, then revel in the low prices at Harbour Town Outlet Shopping Centre, then take in panoramic vistas at SkyPoint Climb, and finally explore the striking landscape of Burleigh Head National Park. To see photos, more things to do, and tourist information, use the Gold Coast trip itinerary maker site . Dallas, USA to Gold Coast is an approximately 22-hour flight. You can also do a combination of car, flight, and train; or do a combination of bus, flight, and train. The time zone difference when traveling from Dallas to Gold Coast is 16 hours. Expect a bit cooler temperatures when traveling from Dallas in September; daily highs in Gold Coast reach 74°F and lows reach 55°F. Wrap up your sightseeing on the 4th (Wed) to allow time to drive to Noosa. On the 5th (Thu), stroll through Kings Beach and then tour the pleasant surroundings at Mooloolaba Beach. On your second day here, get engrossed in the history at Discover Eumundi Heritage & Visitor Centre, browse the eclectic array of goods at The Original Eumundi Markets, and then kick back and relax at Peregian Beach. To find other places to visit, traveler tips, photos, and more tourist information, read Noosa trip itinerary builder . Getting from Gold Coast to Noosa by car takes about 3 hours. Other options: take a bus; or take a train. Wrap up your sightseeing on the 6th (Fri) early enough to travel to Airlie Beach. Start off your visit on the 7th (Sat): look for all kinds of wild species at Wildlife Areas. On the next day, add some adventure to your tour with a kayaking and canoeing tour, then explore the activities along Heart Reef, and then stop by Grotty Yachty Clothing. To see traveler tips, photos, maps, and more tourist information, go to the Airlie Beach online travel route planner . Do a combination of bus and flight from Noosa to Airlie Beach in 10 hours. Alternatively, you can drive; or do a combination of train and bus. September in Airlie Beach sees daily highs of 77°F and lows of 68°F at night. Wrap up your sightseeing on the 8th (Sun) early enough to travel to Port Douglas. Get in touch with nature at Safaris and Scuba & Snorkeling. Eschew the tourist crowds and head to Spas & Wellness and With Sugar. Next up on the itinerary: identify plant and animal life at Hartley's Crocodile Adventures. To find ratings, reviews, traveler tips, and other tourist information, you can read our Port Douglas trip planner. Getting from Airlie Beach to Port Douglas by combination of ferry, flight, and shuttle takes about 6 hours. Other options: do a combination of bus, flight, and shuttle; or drive. When traveling from Airlie Beach in September, plan for somewhat warmer days in Port Douglas, with highs around 83°F, while nights are about the same with lows around 66°F. Finish your sightseeing early on the 11th (Wed) so you can drive to Cairns. Step off the beaten path and head to Trinity Beach and Barron Falls. Get outdoors at Balloon Rides and Scuba & Snorkeling. Step out of Cairns with an excursion to Australian Butterfly Sanctuary in Kuranda--about 36 minutes away. The adventure continues: take in the architecture and atmosphere at St Monica's Cathedral. For ratings, maps, traveler tips, and tourist information, go to the Cairns online trip itinerary planner . Getting from Port Douglas to Cairns by car takes about 1.5 hours. Other options: take a bus; or take a shuttle. In September, daily temperatures in Cairns can reach 83°F, while at night they dip to 66°F. Wrap up your sightseeing on the 14th (Sat) to allow time to travel back home.